Over a long motorsport career Rick Bates has driven a huge variety of cars in events almost too numerous to list – from Targa Tasmania to the Bathurst 24 hour, from the Panama - Alaska Marathon to the Australian Rally Championship. But when you ask him if he’s ever driven a diesel rally car – one like the Hyundai i30 CRDi idling next to us – his answer is simple. “Er, no,” he says. 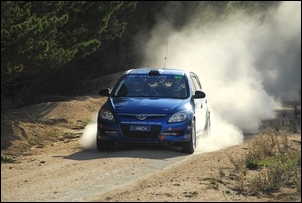 A diesel rally car is a rare beast – a diesel rally car in Australia an unknown. And that’s one reason Team Hyundai Rallye – supported by a range of sponsors but with the primary one Hyundai Genuine Parts – picked the diesel rather than petrol i30... it’s different. 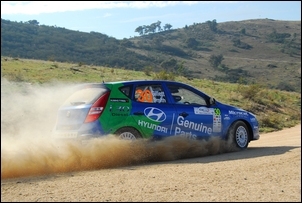 Running in the Showroom / Eco Challenge class of the Australian Rally Championship, the car is brand new – when we saw it, driver Mick Gillett and co-driver / engineer Harvey Smith had done less than 20 kilometres. 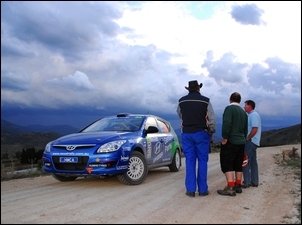 And that’s why the i30 was here, on Rick Bates’ rally development track – a closed forest road near Canberra. The scenery was stunning, the surface slippery gravel and the program an intensive one-day test and development session of both car and driver. Despite being in a Showroom class, the i30 is of course not completely standard. 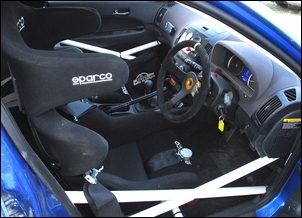 Safety gear includes new seats, harnesses, a complex cold-drawn, welded steel roll cage (that extends to front and rear shock towers) and the removal of all six airbags. 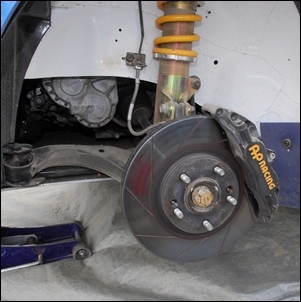 Front brakes are large AP racing callipers biting on NF Sonata discs, while rear brakes are – for the time being - standard. Pads are SBS double carbon fronts and carbon ceramic rears. Front and rear dampers are remote canister 50mm MCA – Murray Coote Automotive – with full adjustability over high-speed and low-speed bump and rebound. 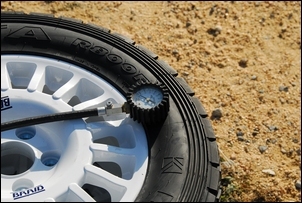 Springs are from King and the standard anti-roll bars are used. 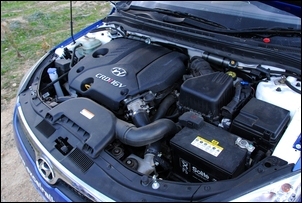 The engine has lost its mufflers from the cat backwards and power and torque benefit from an ECU reflash. Peak power at the wheels is up 14 per cent to 79kW at 3700 rpm, while torque rises 14.5 per cent and maxes at about 2700 rpm. However, perhaps the biggest news from the retune is the much stronger torque curve from 1800 – 2600 rpm - here torque has increased by as much as 56 per cent! Peak boost is 20 psi and the intercooler is the small, standard item. A torque-sensing Modena limited slip diff has been fitted and wheels and tyres are rally spec (Braid and Kumho, respectively). 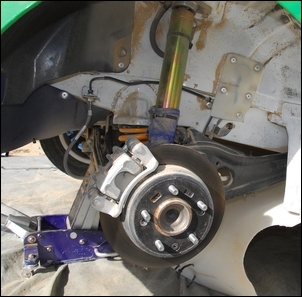 The gearbox is standard but a custom clutch is used. Cryogenically-treated gearsets are soon to be fitted to the ‘box. 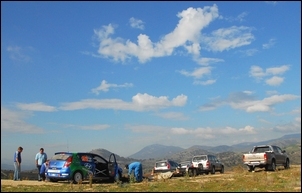 Ready to rally, the car weighs 1383kg – the minimum weight for this model in the class. The track that Rick Bates uses as a development loop is about three kilometres long. It varies in width from being a near goat-track to being typical of a country dirt road. The corners are equally variable, some being just-discernible bends to others being tight 90-degree corners, often with obstacles like large rocks or drain culverts located on the edge of the road. The road also changes sharply in elevation, with blind crests and steep up- and down-hill sections. To be honest, despite riding the track in the rally car and walking much of it, I simply didn’t realise how variable the terrain was. 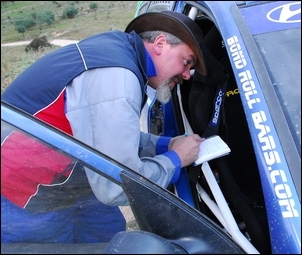 Then I sat in a car with Rick Bates and the rally car crew as they slowly drove around the track, for practice purposes pace-noting every part of it. It was only then I realised the complexity of understanding a road that not only goes left and right, but also up and down and varies in camber, roadside obstacles, surface condition and vision. But that awakening was to occur much later in the day; right now the Hyundai was just coming off the trailer. 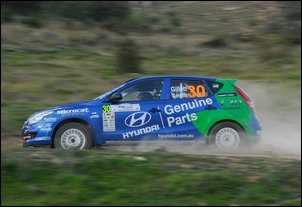 The first task was for Bates and regular driver Gillett to go for a quick drive, establishing both a baseline for car set-up and also to acquaint Bates with the Hyundai. I think perhaps it also acquainted Mick Gillett with a really fast exponent of the old-school, tail-out-slide-them-into-the-corner type of rally driver; when they returned and I asked Mick if the drivers had a similar style, he laughed a little hysterically. In fact, I think Bates - without in any way intending to do so - knocked quite a lot of confidence out of Mick; when a driver can step straight into an unknown car and immediately go so quickly, it is impressive. But it also needs to be remembered that this was Bates’ own training area: he knows the road perfectly. However, in a way that episode set the scene for the day’s development: this wasn’t about making the rally car go as fast as was humanly possible, this was about making the car go fast in the hands of its driver Mick Gillett... and that meant setting the car up to give Mick the confidence to go as hard as he could. In a way that’s like modifying a personal road car - more than anything else, you want handling that makes you feel comfortable, relaxed and in control. Anyway, the first mechanical change didn’t relate to who was driving the car – the front-end was bottoming out on a particularly nastily placed rock, and so high-speed bump stiffness of the front dampers was increased. Out on the test track that change worked well, but there was some discussion of ride height. Rick thought the front ride height was too low, and so the adjustable spring platforms were wound higher. Again, the adjustment was successful. In fact, one of the aspects of the whole day that amazed me was that every single change made to the car resulted in an improvement - after each alteration, Mick felt happier and the car was faster. About this time I was invited aboard for a ride. My only other rally car ride is with former Australian Rally Champion Ed Ordynski in a Lancer Evo (a four wheel drive turbo), some 13 or 14 years ago. That had also been a testing session, conducted on a challenging logging trail in Tasmania. The ride with Ordynski is the most impressive I’ve ever had: the car was so fast, the road so treacherous and Ed so incomprehensible in what he was doing, his feet and arms moving in a precise blur as the car yawed continually, the centre of the car uncannily and precisely following the path of the road. Thinking back, his performance reminds me more of an extraordinary, artistic dancer rather than that of a driver. I knew the i30 would be very different, and it was. My first ride was with Bates – he was taking it easily and it showed. The car surprised with its grip – even with the LSD, I’d expected lots of wheel-spin but I was hard-put to detect any – and the ride quality was startlingly good. Bates used the handbrake to get around the really tight stuff – he later said that if it was his car, he’d have far more rear brake bias so they he could get the car yawing on entry under brakes – and occasionally flicked the steering to get the back out and create better turn-in. But he was smooth, progressive and fluid. Next up was Mick Gillett. Mick is a vastly less experienced rally car driver and as you’d expect, it showed. Having driven mostly front-wheel drive Excels - cars he says that could be massive oversteerers - rather than get the car sideways early, he tended to arrive at the corners, get on steering lock, and then work with what resulted. If what resulted was understeer, Mick was hard on the brakes – not just dabs but hard – including on, before and after the apex. Mick was more brutal with the throttle – this time there was obvious wheel-spin – and perhaps twice as hard as Bates on the brakes. 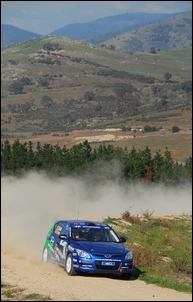 It was stop/start, left/right, on/off rally car driving. Just once or twice it came together, Gillett’s skill showing, the car responding and the movements beginning to flow and coalesce into a smooth, segueing sequence. 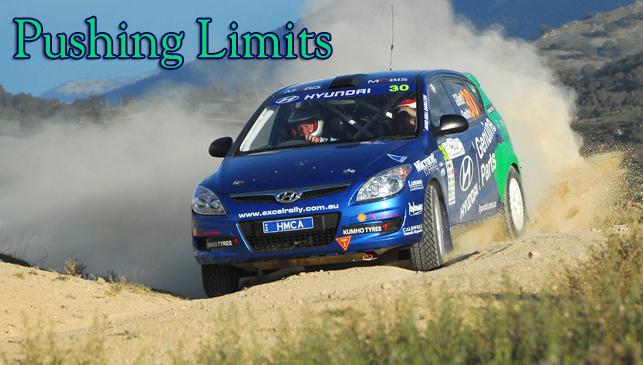 It’s easy to assume that all competition drivers are naturally hugely gifted – that it comes just like breathing. It’s also easy for journalists to go for rides only with people already at the top of their game. Each time Mick came back from a test, he walked away from the others, looking out at the mountains and cloud that stretched for tens of kilometres. But I knew he wasn’t seeing them; he was replaying in his head the drive he’d just done, thinking of how he could do better, thinking of the comments of the more experienced driver, thinking of the corners and the impact of the mechanical changes on the car’s handling. And also thinking of how he’d once crashed a rally Excel in testing just like this. “That was a hard phone call to make,” he says. By now the Hyundai wasn’t turning-in as well as it should – so the front alignment was swapped from toe-in to toe-out and again the drivers went off testing. Then slightly taller, stiffer rear springs were fitted – interestingly, without any change to rear damper settings – and the car headed back to the test road. Notes were taken, views were heard and exchanged, and the day wore on with quiet, professional efficiency. People were blunt but thoughtful (“Mick’s driving better now, less on the brakes mid-corner and a lot smoother”) and there was an air of careful progression to a realisable goal. Finally, late in the afternoon and just before the exposed hilltop was swept with rain and hail, a different approach was tried. 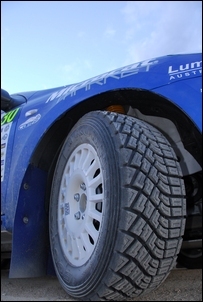 Timed flying laps of the course were driven by Rick Bates, and then the tyres’ width was changed – upsizing them from 195 to 205. Again Rick took the wheel – and the result was that, despite the wider tyres also being slightly taller, the car was quicker. But out by the test road, away from the others and with the shadows lengthening across the valley, I saw the i30 simply flying. 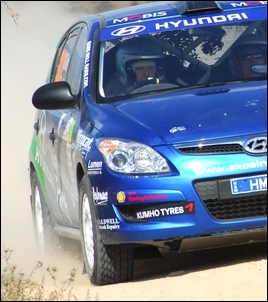 With a set-up way better than it’d had the day’s beginning, and with the vastly experienced Bates on his home ground, the Hyundai was exhilarating to watch. The engine never fell off torque – something it could be heard doing earlier in the day – and was inch-perfect in placement. Standing only metres from the road, the car’s speed was breathtaking. I was privileged to be asked to attend such a day - a day of development for both a driver and a car.